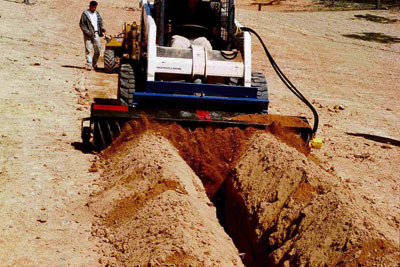 The 2000 series was developed to handle the larger jobs of back filling that is associated with the medium size trenchers. 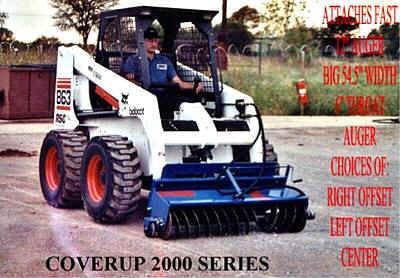 The 2000 can be adapted to nearly all of the skid steer loaders as shown above and some trenchers such as the 3700 Ditch Witch. When used on a skid steer the problem of tearing the turf, by the constant skidding of going back and forth to cover the trench, is eliminated by allowing the operator to straddle the trench and cover it in one pass. The problem of digging in and dumping with a blade on a trencher is eliminated by the floating action of the 2000. Also, since the trencher straddles the trench, it is also backfilled with one pass! Overall Width: 66" Auger Width: 54"
Overall Height: 19" Overall Depth: 20"
Weight: 350 lbs Auger Diameter: 12"
Drive: Ross Torqmotor Center Opening: 6"
Steel construction, sandblasted with 2 step polyurethane finish. Copyright 2008 McCullough Coverup | Karmel Inovations.